When you create a Word document, you're making something that's really a digital piece of paper. Indeed, in Word 2013 you can't even turn off the fake piece of paper shown for each page without switching into web layout view. PowerPoint presentations are aping fancy overhead projectors and whiteboards, down to the fake pen you scribble on them with. OneNote is the engineering notebook, down to the ruled lines for writing on if you want to see them. None of those are bad things – they're familiar ways of working and if you're writing an essay or putting together a set of charts and bullet points to talk about in a meeting, the document metaphors do still make some sense. But that's all a long chalk from the way we swipe through photos on a phone when we're showing them to friends, or catch up with social media in an app like Flipboard. If you settle down to enjoy a long article in a magazine, it's just as likely to be on a tablet or a website as on paper, with big background images that change as you scroll and interactive visualisations you can play with, using responsive design that adapts to the device you're using. Wouldn't your next company report be more impressive presented like that? So far, creating those has meant hand-coding a lot of CSS or finding the budget for a web designer, app developer or both. 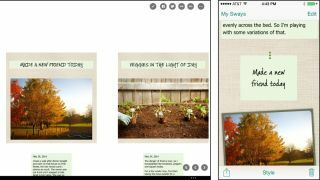 Sway is a new Microsoft Office app (and web service) that aims to make it easy to create what Microsoft's David Alexander calls stories rather than web pages. "You can create and view Sways in a browser, but Sway doesn't just make websites. Sway is an immersive and interactive canvas for sharing ideas, that is digital." What you're making could be a presentation or a report, a catalogue or an essay, a quiz or even a 'choose your own adventure' story, pulling content from your phone's camera roll or from Twitter, Facebook, YouTube or a map site as well as text you type in (or dictate using your phone's voice recognition). Think responsive design like the New York Times' famous Snow Fall story meets Flipboard. Think DTP for modern web pages – think HyperCard, if you remember Apple's digital stack of connected cards. None of them are exactly what a Sway is, but you can make something rather like any of them in Sway. Anything you can put on a computer is digital, but Alexander insists that Sway is digital in a different way (and he's not keen on comparisons to things Sway is like). "We didn't try to emulate an analogue form of content. We didn't say 'we're a document so we should be modelling a piece of paper'. We're not trying to emulate a slide presentation on a flip chart so we have to have slides in a certain way. Given the digital age, the very web-oriented age we live in, the best type of content doesn't have to have a parallel in the analogue world. It doesn't have to be similar to any other thing and it can be optimised for the web." The layouts you see in Sway today are simple horizontal and vertical layouts, but more are coming (probably around nine) with different ways of arranging content. "The traditional presentation or report is very linear," Alexander points out. "By being very digitally authentic and web-oriented we can make new forms of storytelling that don't have to be linear." But the really interesting thing is that you don't start by picking the layout you want. "We're taking the traditional content authoring model and flipping it on its head. It used to be you start with a blank page and you specify parameters, you specify how things fit exactly on an XY axis. Here you pick the content and Sway will go off and build the output for you and then you can tweak it as opposed to you having to build it from the ground up."